Move over Fantastic Four, Famous Five and Magnificent Seven. 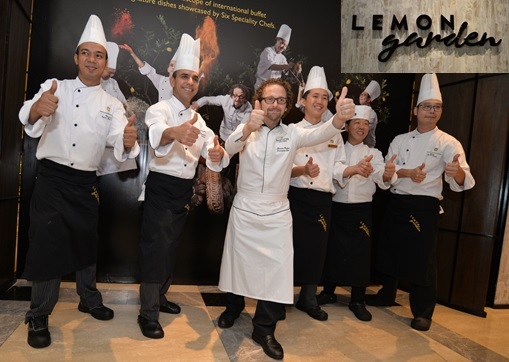 Make way for Shangri-La Hotel Kuala Lumpur's 'Super Six' speciality chefs who are stepping into the limelight at Lemon Garden. The spotlight is trained on each chef's handpicked signature dish; served at the different interactive and live cooking stations throughout the spacious all day dining restaurant. That day we decided to start with Chef Au Yong Guan’s Double Boiled Chinese Herbal Soup with Black Chicken to whet our appetite. The clear soup prepared with chicken feet, red dates, wolfberries and Chinese herbs like dong gwai and dong sum is a nourishing concoction to improve blood circulation, boost one's energy level and revitalise kidney function. Double-boiled for 4 hours, every heartwarming spoonful of the sweet broth reminded us of hearth and home. The Japanese Kitchen helmed by Japanese Executive Chef Nao Takeshita beckons with a plethora of sushi rolls and sashimi. Taking pride of place is the chef’s Seafood Big Roll — also known as the Good Luck Roll in Japan. We were told the ingredients used represent good health, happiness and prosperity. Take your pick from Prawn Tempura Maki Roll or Seafood Maki Roll; the vinegared rice roll comes packed with tempura prawn, cucumber and shiso leaves for the former while sea bream, salmon, red tuna, salmon roe, yellowtail, sweet shrimp and Japanese omelette are the fillings of choice for the latter. Both, upon our sampling, came up to scratch. You can assured the plethora of sushi and sashimi here will also leave you replete. Executive Chef Olivier Pistre conjures not one but three specialities to tickle our tastebuds at the Western Kitchen. As avid cheese fans, we were stoked to find Raclette, a cheese dish originally from Switzerland but also popular in the French Alps. We enjoyed relishing the sumptuous raclette cheese melted over a salamander (overhead grill), served atop boiled baby potatoes, gherkins, pickled onion and bresaola (air-dried meat). Banking on the evergreen appeal of Italian fare, Chef Olivier also proffers Tortellini and Calzone. Similar to Chinese wonton, the tender, little dough parcels are said to be inspired by Venus’ navel. Stuffed with spinach and three types of cheese, anyone who tasted them would succumb to their decadent appeal. Here, the chef artfully balances the pasta’s lush savouriness with the muted sweetness of butternut squash purée. Beef sausage, spinach, mozzarella, ricotta and pecorino form the rich, hearty filling for Calzone, a Naples delicacy meaning pants or trouser leg in Italian. Made from salted bread dough, it’s basically a huge pizza folded in half. Actually if you're partial to Italian food, Lemon Garden's vast selection of antipasti, pasta and pizza will leave you spoiled for choice. Our local Malay heritage is proudly upheld by Malay Chef Mustafa Kamal and his speciality of Rendang Tok, a Perakian favourite that needs no introduction. Lovingly cooked to dark, glistening perfection, the recipe of simmered beef in ground spices, chillies, rich coconut milk and dry-fried grated coconut belonged to the chef’s beloved grandmother. We had a field day savouring the delicious rendang with biryani rice. Its closest rival in terms of robust hotness and spice-high appeal has to be Indian Chef Devender Singh’s Murgh Kasurimethi. A signature dish inspired by the chef’s mother, the bright and piquant chicken curry is a trailblazer with assertive accents of dried fenugreek leaves, Kashimiri chilli powder, cloves and multitude of exotic spices. There’s no way you can avoid ladling this sumptuous curry over rice or dipping pieces of fluffy bread into it. Such a strong symphony of flavourful specialities require a noteworthy conclusion but Chef de Cuisine Goh Ti Cheong proves his dessert is no pushover. We reckon he’s a brave soul who dares to push the sweet boundaries with his rather pungent Durian Croquembouche Peanuts Nougatine with Sesame. It’s a heavenly take on the classic French profiteroles for us durian lovers but possibly sheer hell for haters. Luckily the durian odour is subtle enough and should pose no cause for concern. I especially love the decadent Durian Cake with scorched meringue.